This November, nearly 200 women are running for Congress. Most are not going to win, if the past is any guide. Of the 535 representatives and senators currently serving, only 99–18.5 percent–are women. The financial world is even bleaker: Women hold just 4.6 percent of Fortune 500 CEO positions. Why are there so few women in positions of political or economic power in this modern age? One way to answer that question is by examining the story of the greatest woman ever to rule in the ancient world: an Egyptian pharaoh who serves as model and cautionary tale for today’s female politicians. Hatshepsut understood the obstacles in her path. In Egypt in the 15th century B.C., women were considered sexual companions and the carriers of men’s seed, not rulers. But Hatshepsut found her way to the throne of the richest and most powerful state in the ancient world. Yet few today even know her name, much less how to pronounce it (Hat-shep-soot, if you’re wondering). A mere 25 years after her death, ruling elites had her statues smashed into bits. We only know about her today because, while those long-ago revisionists chiseled away at the first layers of her Temple of Millions of Years at Deir el Bahari, her detractors kept most of the sacred structure intact and left outlines of her inscriptions and figures readily visible. Archeologists first pieced back together the fragments of statues thrown into pits in the sand in the 1920s and 1930s, but their reconstructions didn’t always make sense to me. Hatshepsut became a king, because ancient Egypt had no word for a female ruler. She won this prize because she was the most able person for the job and understood the complex relationships among all the players. I wrote my book about Hatshepsut, The Woman Who Would Be King, after the birth of my son, beginning it in the darkest hours between nursing and diaper changes. Motherhood made me realize, as I never had before, how trapped women are by our bodies, our ability to reproduce and nurse, the oxytocin that compels us to nurture and bond. Hatshepsut must have felt the same kind of entrapment after she gave birth to the child of her half-brother, the king, while still in her early teens. That child (named Nefrure) was a girl, not the son for whom her people had so fervently hoped. But in the end, Hatshepsut’s lack of a son laid the foundation for the rest of her strange and charmed life. Hatshepsut’s husband passed away after only three years of rule, when Hatshepsut was very young, perhaps about 16. At the time, the next in line to be king of Egypt was a mere infant–not her own baby, but a baby belonging to one of her husband’s second-class wives, one of the many beauties in the harem. Hatshepsut had the power to fill this vacuum. Her bloodline was impeccable, reaching back to the kings of the earlier 18th Dynasty. She had an education, likely begun in early childhood and probably led by the highest-ranking dowager queen, the High Priest of Amen, and her own father, himself a king. Not only was she the highest-ranking royal wife, but also she was Egypt’s most powerful priestess, known as the God’s Wife of Amen, with lands and officials of her own. Hatshepsut made sure the young king–that infant son of a lesser wife–was cared for, educated, brought up in the temple mysteries, and trained in the military arts. But since he was still too small to fill the role of king, Hatshepsut took charge and acted as regent. So it was Hatshepsut who gave the vizier–the king’s second-in-command–orders about trading ventures to the land of Punt, who discussed treasury matters with her royal steward, and who put down insurrections in Kerma (in modern-day Sudan). She even personally oversaw the collection of the spoils of war, according to a tomb inscription written by her overseer of the treasury. 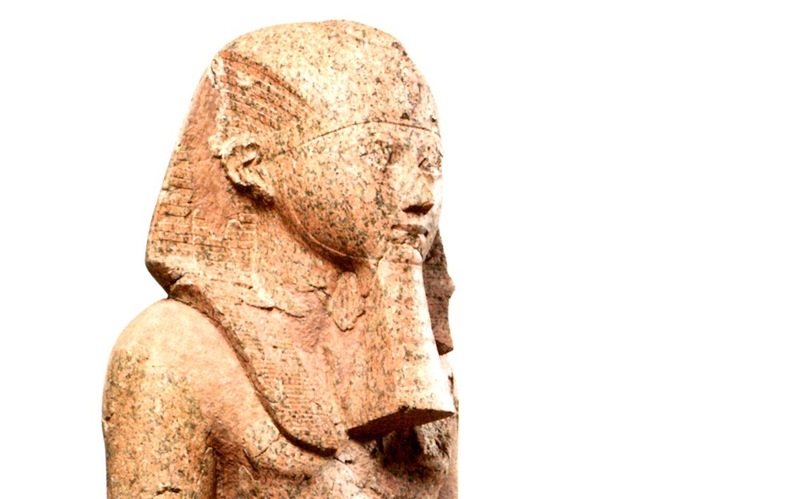 Then, for reasons that were not recorded, Hatshepsut was given–or decided she needed–more. When the young King Thutmose III was just 8 or 9, Hatshepsut was crowned king alongside him, with, as far as we can see, the full support of her courtiers, Egypt’s elite families, and its powerful temple priesthoods. For the rest of the reign, Hatshepsut took the lead: In reliefs, she is always shown first. Hatshepsut became a king, because ancient Egypt had no word for a female ruler. She won this prize because she was the most able person for the job and understood the complex relationships among all the players. Hatshepsut also built a strong cohort of supporters: men whose continued prosperity depended on her power. Chief among them was a financier named Senenmut, in charge of palace and temple treasuries. All the income–lands, gold, oils, wine, perfumed ointments–of these two great institutions was under his control. Many historians cannot help but suggest that she had an affair with Senenmut to maintain her power. But no real evidence of an affair exists, and Senenmut was not Hatshepsut’s only avenue to power. When Thutmose III was approaching his 16th year, she tried another unprecedented strategy to retain power. In statuary, in reliefs, maybe even in rituals before her elites and populace, she took on the appearance of a man. She bound her breasts; she wore a masculine kilt; she tied on the long beard of kings; she wore a bull’s tail down her back to take on the powers of the most important of the sacred animals of ancient Egypt. She was ostensibly past childbearing years, which meant that she would never bear her own heir to the throne, and her co-king was quickly becoming a man. She had to stay ahead of him. Historians have given many explanations for Hatshepsut’s power plays: an unreasonable greed and lust for influence being chief among them. In many history books written by 19th- and 20th-century Egyptologists, she was cast as a witch who cruelly usurped the rightful king’s throne before he was old enough to do anything about it. But an analysis of the political forces at play suggests a different story; there is no sign that the ruling elites sought to remove her and she never sought to oust her young co-king. She actually helped Thutmose III’s position by keeping him by her side. She taught him the kingly arts by example, demonstrating how to cultivate a professional group of bureaucrats to manage her country’s wealth, create jobs, and commission monuments. Thutmose III accompanied her on campaigns to Kush, presumably participating in the battles, the dispatch of enemies and the taking of spoils. The investment paid off: Thutmose III became the greatest warrior king Egypt had ever seen. Her success in keeping Egypt rich and powerful likely explains why we have forgotten her. Men wanted to claim her successes after her rule. Her reign became troublesome as Thutmose III was grooming his chosen son to be next in line. It is even possible that a child of Nefrure’s–a higher-born offspring–was a threat to Thutmose III’s chosen heir, or that Nefrure herself was creating her own avenues of authority. Divine kingship is a tricky thing, and the possibility of another woman taking the throne was a complication he decided to erase. So down went the statues and the first layer of the temple reliefs. We’ve come a long way since the 15th century B.C., but what’s interesting is how much remains the same. Like Hatshepsut, Hillary Clinton has a golden political pedigree and a carefully cultivated network of supporters within the Democratic Party. She served capably as secretary of state, one of our country’s most visible roles. But, as a possible contender for the presidency in 2016, she is still often regarded with suspicion, if not outright hostility. Some claim she overstepped her bounds when she took on healthcare reform as first lady; others can’t help but criticize her pantsuits, “shrill” voice, and hair-styling. There’s a friction when a woman tries to step into a role that before her was always played by a man. Kara Cooney is associate professor of Egyptian art and architecture at the University of California at Los Angeles. Specializing in craft production, coffin studies, and economies of the ancient world, Cooney received her doctorate in Egyptology from Johns Hopkins University in 2002. Cooney produced a comparative archaeology television series entitled Out of Egypt in 2009, which is still available through Netflix and Amazon. *Photo courtesy of the Metropolitan Museum of Art: Hatshepsut with offering jars, from the upper court of her mortuary temple, Deir el-Bahri, Egypt, 18th Dynasty, c. 1473-1458 B.C.